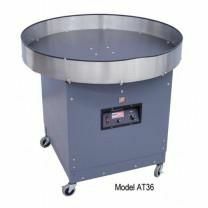 These powered Rotary Accumulator Tables have variable speed control to help with bottleneck processes. Usually, Accumulator Tables are positioned at the end of a production cycle where products are considered ready for whatever the next step may be. These Accumulator Tables can be used in conjunction with Gravity Conveyors, Heat Tunnels, L-Bar Sealers and Combo Shrink Systems.